The amazing Arctic tern is the phenom of all migrating birds. With an annual round trip of roughly 45,000 miles, this stellar specimen is rivaled by no other in endurance and perseverance in seeking out prime conditions fro feeding and breeding for survival of the species. Churchill is a key summer destination with a bounty of food and nesting areas. Three magnificent photos from Andy Murch in Churchill. The Arctic tern is an amazing bird with the longest migratory path of any bird travelling pole to pole throughout the year. Watching terns scavenge capelin from the waters surface in Churchill after being churned up by feeding beluga whale pods is quite an experience. Arctic Terns are truly an opportunistic species! An overcast day in Churchill provided the perfect setting for some beautiful photographs of the natural surroundings of the region. Birds are nesting and the wildflowers are blooming all over the tundra. Beluga whales are arriving in the Churchill River in pods and we will be posting photos soon from some Natural Habitat Adventures trips in July. Enjoy these Awesome photos! This exquisite close – up image of an Arctic Tern incubating eggs on its nest shows just how camouflaged their eggs are. It took me awhile to even see the one egg in front of the tern since it blends so well into the tundra. Arctic terns lay 1 – 3 eggs and both the male and female incubate the eggs for up to 22 days. After birth the parents supply small fish up until they fledge at three to four weeks old. Female and male Arctic terns mate for at least a year and can mate for life. Females lay eggs once a year. Terns live on average up to 34 years. 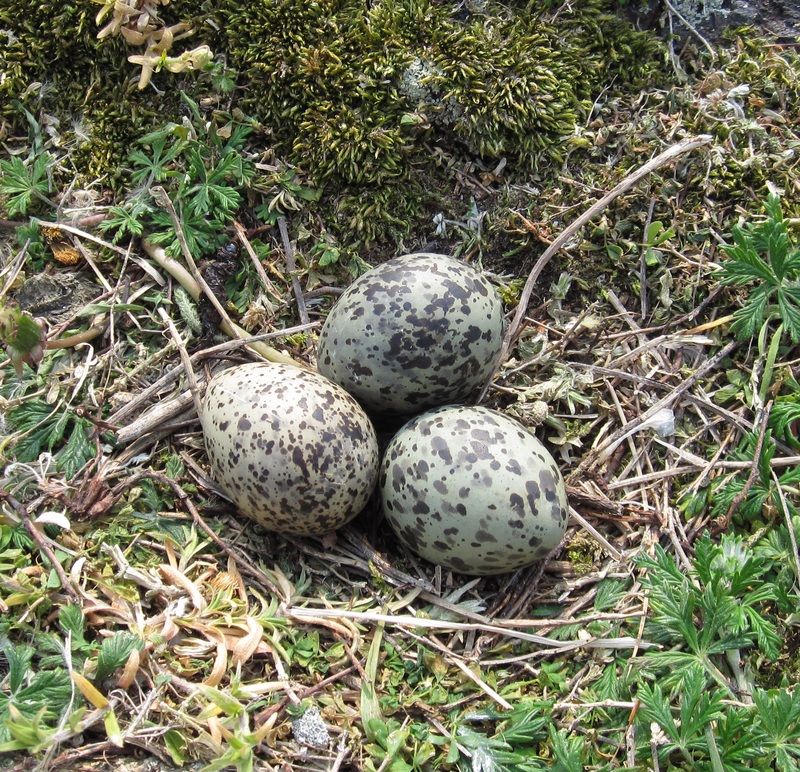 The photo of the three Arctic tern eggs illustrates the magnificent camouflage adaptation the eggs have developed over many years. The way animals and their eggs adapt to the environment using camouflage is fascinating. Survival of species depends on these slight changes over periods of time. The faster a species can adapt the longer they can survive in nature. The Precambrian shield rolls down to the Hudson Bay in Churchill. Rhonda Reid photo. Precambrian shield with a bog and krumholz spruce. Rhonda Reid photo. These two photos of Precambrian shield rolling toward the Hudson Bay show how the rocks have been smoothed over in previous eras by ice and water covering them. If you look closely you can see marks or “striations” caused from rocks embedded in the bottom of glaciers that were dragged over them during the slow movements of the massive ice formations. It’s quite interesting to search out these striations while hiking over the shield in Churchill. Eider duck female and her brood of five chicks. Rhonda Reid photo. Let’s face it, “cold” is what the Arctic does best….especially to those living below this amazing region of our planet Earth. So, other than the hearty mammals, particularly the mighty polar bear and humans, very few birds overwinter at high latitudes. Less than 10% of all birds that venture to Arctic and sub-Arctic regions unpack their bags and set up a permanent home there. Birds that do either have some hearty DNA or have developed some unique ways to cope with cold temperatures that can dip to -55 Celsius. Most of you know the raven can subsist just about anywhere on the planet and the intelligence and intuitiveness of this creature has been well documented. He is truly the sentinel of true survival…especially as his shining black defiantly glares out against the snowy north. Rock and willow ptarmigan can be seen in Churchill as the fall arrives and throughout the winter, changing to their winter’s best camouflage white. Ivory and the illusive and highly prized Ross’s gull also stay put for the winter. I’ve spotted the Ross three times in over a decade of guiding Natural Habitat Churchill summer trip. All three times the sightings were facilitated by Churchill birding master and legend Bonnie Chartier when we worked together up north. The Common and hoary redpoll, Brunnich’s Guillemot, Little Auk and Black Guillemot also inhabit the Arctic full-time. Snow buntings and gray jays are quite friendly species that call Churchill home all year. Higher up in Greenland the birds tend to shelter in utility tunnels known as utilidors. Boreal chickadees and occasionally boreal owls and great horned owls inhabit the boreal forest. And, the mighty gyrfalcon, the fourth fastest bird on the planet…er off the planet, can be seen sporadically hunting or soaring from point to point. I have seen this bird dart across the Churchill tundra and even through town. Gyrfalcon on the tundra in Churchill,MB.Paul Brown photo. The most intuitive behavior exhibited for warmth and survival is how ptarmigan and common hoary redpolls take shelter in snowdrifts and endure the frigid cold by utilizing the snow as insulation. Ptarmigan and Snowy Owls grow leg and feet feathers to keep them warm throughout the winter months. They also change plumage from dark to white in order to stay camouflaged and safe from predators. Snowy owl greets virgin travelers to the north. Colby Brokvist photo. The summer months are reminiscent to a beach-side resort with the bird population ballooning by more than 200 additional migrant species arriving in early spring. These are birds that cannot survive the harsh conditions of winter in the far north though return each year to take advantage of the bounty of food sources thriving in the Arctic summer. The most incredible journey is clearly that of the Arctic tern…making the pole to pole round trip of nearly 45,000 miles. Arctic tern hovering above the nesting grounds. Rhonda Reid photo. Many of these species arrive early and set up nests for the short but productive breeding season. With snow cover still prevalent, these hearty nurturing parents live off their stored fat reserves for energy. The majority of the Arctic and sub-Arctic species are wetland feeders such as various ducks, swans and geese. Waders and shorebirds also scour the marshes and shoreline plucking all the organisms they can from the Earth.